Dramatic endings are nothing new in motor racing, even if they are less frequently encountered in long, drawn out endurance races than in the more hectic excitement of Formula One and Formula Two events. But the finish to the 45th edition of the 24 Hours of Le Mans that took place on June 12th was exceptional by any standards, with the winning Porsche 936 suffering a virtual engine failure 45 minutes from the end. After half an hour's stay in the pits, during which time its turbocharger was switched off to minimise the risk of further damage, the Group 6 Porsche staggered round two final laps on five cylinders to take the chequered flag not merely as a finisher but as the comfortable though crippled victor of a race marked by wholesale mechanical carnage amongst the faster cars. For the three drivers of the victorious, Martini sponsored Porsche it was an historic and memorable occasion. Having taken over the car late on Saturday night and then smashed the lap record in his bid to regain lost time, the Belgian Jacky Ickx took his third consecutive win in the 24 Hours, and his fourth ever, a feat only previously achieved by fellow Belgian Olivier Gendebien. 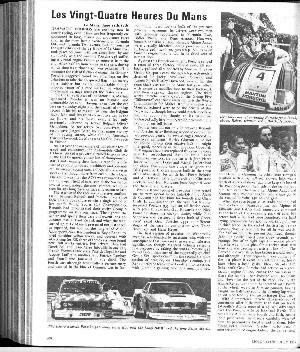 As for Ickx's two co-drivers, the result gave Jurgen Barth the first major victory of his racing career, while for the American Hurley Haywood, Le Mans was his first ever race in Europe.